Notwithstanding the global economic crisis, MNC arms in India have continued to see a hike in promoter interest. Among 115 MNC arms surveyed by FE, promoters stake increased to 62.84% as on September 30, 2010 from the level of 62.67% a year ago. 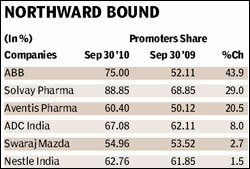 Highest increase in promoters stake was seen in the case of ABB, followed by Solvay Pharma, Aventis Pharma and ADC India on September 30, 2010 from the level of September 30, 2009. The net profit of Solvay Pharma increased by 53.1% to Rs 17.23 crore during July-Sept. '10 from the level of Rs 11.25 crore during July-Sept. '09.The sales of the company also increased by 31.9% during the above period. But the share of promoters stake in total of Foseco India, Singer India, UTV Software and KSK Energy Venture decreased significantly during the above period despite a better profit performance during second quarter. For example, the net profit of Foseco India increased by 31.1% to Rs 5.18 crore during July-Sept.'10 from the level of Rs 3.95 crore during July-Sept.'09.The sales of the company also increased by 48.3% during the above period. Kishor P Ostwal, CMD, CNI Research said, Most of the MNCs want to delist their share from Indian market as they believe in 100% holding globally. Before giving open offer as required under law, these companies increased stake every year under creeping acquisition. The latest shareholding pattern, as of end September 30, 2010, clearly shows that promoters of MNCs have increased their stake over the September 30, 2009 in pharma majors Aventis Pharma and Solvay Pharma. The promoters stake in Maruti Suzuki was same at 54.21% during both the study period. But in the case of Cairn India, the promoters stake decreased from 64.68% to 62.36% during the above period. The food major Nestle Indias promoters stake increased from 61.85% on September 30, 2009 to 62.76% on September 30, 2010. Jagannadham Thunuguntla, CEO & Head Of Equity, SMC Capital also said, Many MNCs feel that growth opportunities in their home countries are getting saturated.And they feel India is a growth market.So,they are increasing their stake to enjoy the benefits of growing Indian market. Among the 115 MNCs, the top five according to share of promoters stake to total stake, as of September 30, 2010 are Astrazeneca Pharma, Fresenius Kabi Oncology., BOC India, Solvay Pharma and Alfa Laval (I). Among these only increase in promoter's stake was seen in the case of Solvay Pharma.